“He calls you Sherlock Homeless.” said a character in what is one of my guilty indulgences: Lee Child’s Jack Reacher novels. If you have read any of the Jack Reacher you may know that the hero is homeless by choice. He spends his life traveling around the country, by thumb, or bus, somehow repeatedly stumbling upon damsels in distress and solving their problems. He uses a combination of raw intelligence, military training, incredible brawn and ruthlessness. But what really appeals to me is that he doesn’t carry anything with him but a toothbrush. Talk about traveling light. He wears a set of clothes until it’s dirty, then buys something new and throws away the old clothes. He doesn’t need anything or anybody. He is strong, fearless and free, a Buddhist vigilante who always wins. Clearly this is a fantasy novel. Yet, as a women of a certain age who has lived in the same house for 37 years, I find this all oddly enticing. Particularly, what he carries. I too wish that I could throw everything out, and just travel light. “What? 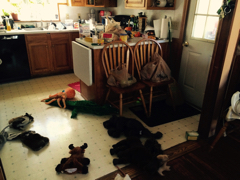 You never throw anything out!” my husband interjected. “And you won’t even leave the grand-kids long enough to do our undisclosed weekends!” he accused. “This isn’t your article.” I replied tersely. In fact, this article is actually about an entirely different book. It’s titled “The Life-Changing Magic of Tidying Up” by Marie Kondo. It was a book club book; not the fantasy that I would have chosen to read on my own. In fact, I picked it up with considerable trepidation, convinced that long-dead relatives would emerge from its pages and ground me until I had cleaned my room. 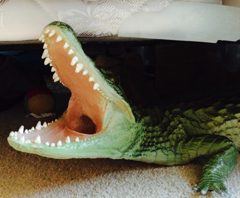 And then the crocodiles under my bed would eat me. There are a lot of chapters in this book, but I am going to sum it up for you in half a page. First the author is odd. Really odd. Generous members of book group attributed it to her Shinto religious background, the rest agreed that it was extreme OCD. Her take on decluttering does not advocate attaining spiritual freedom by shedding material possessions; instead it reveres those possessions. ‘Keep what you love’ may be the sentence that best sums up her philosophy. Perhaps it’s just this unabashed love for things that has made it the decluttering book for our time. Ms. Kondo suggests that you go through this process systemically, starting with clothes, which she considers the easiest, then moving on to office supplies, papers, and finally family pictures and mementoes. At each point, when you have that sad discard pile, you must reverently thank your things for their service, and then let them go. Once you go through this, she assures you, your house will stay tidy forever and your life will magically change. Plus she has suggestions for retaining this pristine state. And, in a statement so obvious that it is amazing that no one ever does this, she suggests that clothes be folded so that they will fit upright in a drawer, thus letting you see what you have at a glance. Although she adds that this will help your clothes to be happier because they can breath. Actually you really should read the book to get the full cumulative effect. Curious readers may want to how this all turned out for me. Ha! I didn’t tidy-up. I put that book down like a radioactive potato and went out and bought a 12th black sweater. None of the other book club members had gone through the process either. One declared defiantly that all her possessions bought her joy; no one could force her to part with them; and that was that. No, it’s really my husbands’ fault. Well, clearly there’s only one solution to this impasse. I just need to stop writing and go back to reading about Sherlock Homeless. After all, reading beats tidying up, fantasy beats reality, and the family that reads together, stays together. Maybe on separate couches. And that’s my personal key to Life-Changing Magic. OMG…this spoke to me. I’m gonna blame my Yankee background too.And Deb Woodard’s mom,my Aunt Margie who has an attic you wouldn’t believe (well, you might, actually. )and my Mom, Bev, to a lesser degree. If I had bought the book, I probably would have read a couple of chapters, and then it would have joined my diet books. I’m to the point of tossing everything.. Richard’s office is full of books, safety manuals, etc. that he has not looked at for 18 years. My studio got a mini clearing out last week, stuff to Goodwill, then the first blizzard came. Stuff still in the car, and the second blizzard arrives tonight. I go through my clothes every now and then, and Do get rid of items I have not worn for year or so! !